Dash Text Debuts Charity Program, First of Its Kind: Dash Text has launched a charity service where individuals can send Dash via SMS to an address for the money to be evenly distributed to all participants. The service is currently in its pilot with 50 students in need at the San Antonio school in Caracas. So far, there have been around 60 transactions a day that have reportedly been used to purchase over 1,000 lunches and 900 beverages. The service differentiates itself from other charities by giving Venezuelans the tools to achieve their own well-being and maximize their personal utility rather than being dependent on pre-determined food donations. Crypto Briefing Modifies DARE Report, Upgrades Dash’s Grade: Crypto Briefings’ Digital Asset Report and Evaluation attempts to provide added value to consumers by summarizing and evaluating different cryptocurrencies. The revision of their methodology has resulted in Dash receiving an upgrade to an overall ‘B’ grade, specifically highlighting version 0.13 upgrade, automatic InstantSend, ChainLocks, and Evolution progress. They also discussed the significant adoption that Dash is seeing in Venezuela and Colombia. Bitrefill Reduces Prices on Venezuelan Vouchers, Works with Dash Text to Circumvent Blackouts: Bitrefill typically pays a premium for mobile topups since they do not have a direct operation in the country, but to help the people in a crisis, Bitrefill is now subsidizing the refills and selling at face value. This is in addition the temporary 10% discount individuals receive for paying in Dash. Bitrefill is also working to integrate Dash Text so individuals can still make purchases even if they do not own a smartphone or when internet services go down within the country. Dash Text has also launched a donation campaign to help give Venezuelans 1,000 free mobile topups. Dash Text Venezuelan SMS Wallet Continues to Work Despite Blackout: Starting last week, Venezuela experienced severe and wide power blackouts, which limited payment processors including some cryptocurrency payments. However, Dash Text was still enabling individuals to send Dash via SMS text. While Dash Text only operates in Venezuela at the moment, this adversity illustrates how it can provide a simple way for many individuals to spend money; even Wells Fargo in the United States had functionality issues last year. Equicex Integrates Dash Into Debit Cards and Exchange, Expands Spending Options and Liquidity: Equicex offers both a regular “Blue” cryptocurrency Visa debit card and a “Black” privacy-focused Visa cryptocurrency card to provide consumers a more complete way to spend Dash. The privacy focused card cost more than the Blue card, but since it is provided by an off-shore bank in Belize, applicants do not have to submit identification information to preserve their anonymity. Equicex also offers an exchange that only charges 0.10% fees to make switching between currencies even more affordable. While Dash is significantly increasing adoption around the world, the Equicex integration is helping to bridge the gap until mass adoption occurs for all consumers. PolisPay Debit Card Expands Consumer Options with Dash Integration: PolisPay, another cryptocurrency debit card solution, has official announced their integration of Dash with their open beta tests. Their goal is to allow consumers to be able to spend cryptocurrency at more merchants using their Mastercard solution so users do not have to wait for direct adoption. Additionally, they have manged to keep costs relatively low since these cards often have their costs subsidized by banks that recover the money through hidden fees elsewhere. Dash Among Top-3 Performing Cryptocurrencies After Initial Exchange Listing: Exchange pricing data from DataLight shows that Dash is the third largest cryptocurrency performer based on gains from when initially listed, gaining 39,500% and only beaten by Bitcoin (1,300,000%) and Ethereum (68,200%). Conversely, newer coins like Bitcoin Cash, Bitcoin SV, and IOTA had a valuation decrease, which could be contributed to over-hyping at launch. Other explanations for the valuation changes could be the length of time required to achieve larger valuations or a maturing market that more accurately prices coins. Additional insights illustrate that providing unique innovations such as Dash’s InstantSend, PrivateSend, DAO, ChainLocks, and more help drive sustainable growth. Blockchain Data and Analytics Platform BlockChair Adds Dash: Dash joins a select grouping of a few cryptocurrencies on the powerful cryptocurrency blockchain explorer with advanced statistics, filters, charts, and viewing outputs. They are targeting advanced cryptocurrency users, researchers, and casual users with a central repository of unique insights to help shed more light on the advantages and disadvantages of each coin. 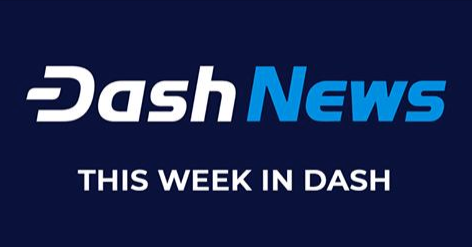 This integration is the latest outlet where Dash can claim increases in its transparency, in addition to its open treasury and voting model, more regular updates from Dash Core Group, and others. Cryptocurrency ATM Thefts Show Insecurity of Zero-Confirmation Transactions: The Calgary police announced they are searching for four suspects that attacked cryptocurrency ATMs over 112 times with double-spend attacks taking advantage of the ATMs zero-confirmations usage. While zero-confirmations make sense for restaurants or other small and repeat merchants, it makes less sense for more expensive merchants like ATMs, car dealers, and others. Instead, Dash leverages its Masternode network to provide InstantSend, which locks-in transactions in under two seconds for less than a penny, so as not to burden consumers with long wait times while also not putting the merchant at risk of a double-spend attack. Possible U.S. Sanctions on Visa and Mastercard in Venezuela Highlight Need for Decentralized Money: The U.S. is considering placing additional sanctions on Venezuela that would severely limit its access to Visa, Mastercard, and other financial institutions. While the policy is intended to only harm Maduro and other high ranking government officials, as most public policies tend to do, there will be unintended effects that will harm everyday Venezuelans that are simply trying to buy food, medicine, and other basic necessities. The issue highlights the need for decentralized money, like Dash, where users can be independent from their own government and foreign powers while still being able to make everyday purchases. Dash Podcast Episode 95 with Ernesto Contreras: Dash Core Group Business Development Manager LatAm joins the guys this week to discuss the behind the scenes work that is involved in promoting Dash and getting more businesses to adopt Dash. They talk about how Dash is uniquely positioned to help individuals across Latin America and how Dash quickly spread after gaining significant adoption in Venezuela. Dash continues to march ahead with significant developments and integrations that make using Dash in everyday life even easier. This results from months and years of hard work by multiple individuals in the community working together and in a decentralize method to bring monetary and financial independence to individuals around the world. Even more exiting news is expected in the coming months that will further help Dash accomplish this goal. Make sure to subscribe to all of our social media outlets to get the breaking news first!